Represented in the OpenSFHistory collection are many images scanned from family collections and scrapbooks. In preparing a recent batch to upload, a series of shots of children in goat-powered wagons caught our attention. We realized that across a few collections we recognized the same goat patiently posing in harness on city sidewalks while a happy child held the reins in a wicker cart. Child (and teddy bear) in wicker goat-drawn cart. (wnp27.3020, courtesy of a private collector). Happy kid in the same wicker cart. (wnp27.2089, courtesy of a private collector). Slightly concerned child with the same very patient goat. (wnp27.3113, courtesy of a private collector). A quick look in my own family photos and I uncovered this shot of my grandfather (far left) standing behind perhaps the same animal. Eugene Slinkey (on left) with cousins and our now-familiar goat friend. The Philadelphia Inquirer in 1910 had a whole article about “fashionable goat-carts” drawn by Angora and Cashmere goats, but noted that “common goats are still to be noticed among the up-to-date youthful drivers.”2 A popular Christmas toy in 1907 was a double goat-pulled cart for dolls. By the 1910s, someone (or many someones) had the bright idea of traveling from neighborhood to neighborhood with a goat cart and a camera. Kids posed as drivers and parents bought the photograph. Ross Fuqua wrote on the Washington State Library blog that so many goat cart photographs are out in the world that the Library of Congress uses it as subject term in their catalog. Ross created a Pinterest board where other institutions and individuals added goat cart photographs from all across the country. 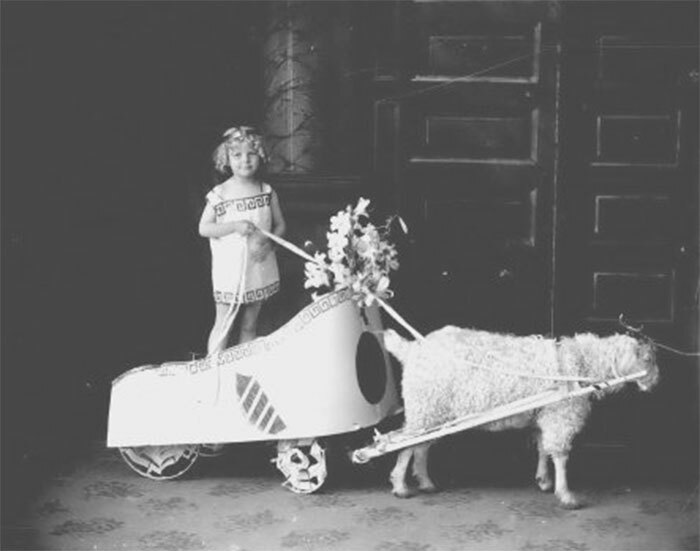 I particularly enjoyed this child in Roman costume driving a “goat chariot” from the Oregon State Library. Goat Chariot image from Oregon State Library collection. 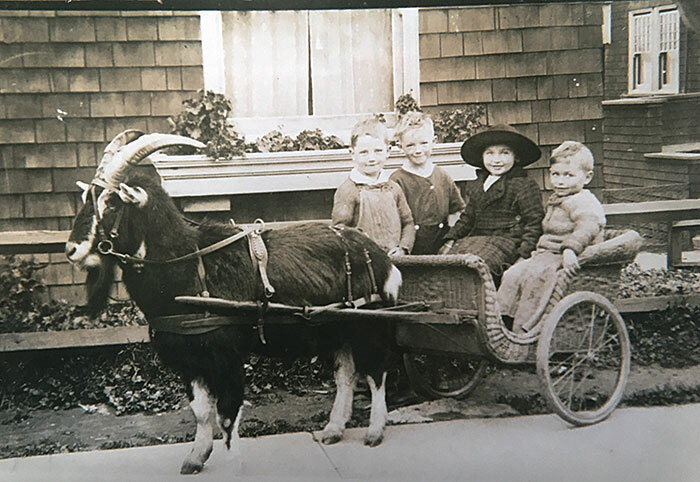 I wasn’t able to figure out who our San Francisco goat man was, although I did stumble on a few ads in local newspapers offering a goat, harness, and cart for sale as a package. Likely these sellers weren’t commercial photographers, but rather parents who bought a kit for their kids during the height of goat cart mania. So many questions these goat carts bring up. How many goat men walked the streets of San Francisco photographing our ancestors? How much did the shot cost and how long did it take to get your souvenir? Did this black-and-white “king of the goats” we keep finding have a name? Send us your clues and guesses using our contact form. “Lucile” riding a goat cart in Golden Gate Park circa 1900. (wnp27.2853, courtesy of a private collector). 1. San Francisco Chronicle, January 1, 1939, pg. 74. 2. “Goats for Pleasure and Profit,” Philadelphia Inquirer, August 7, 1910.